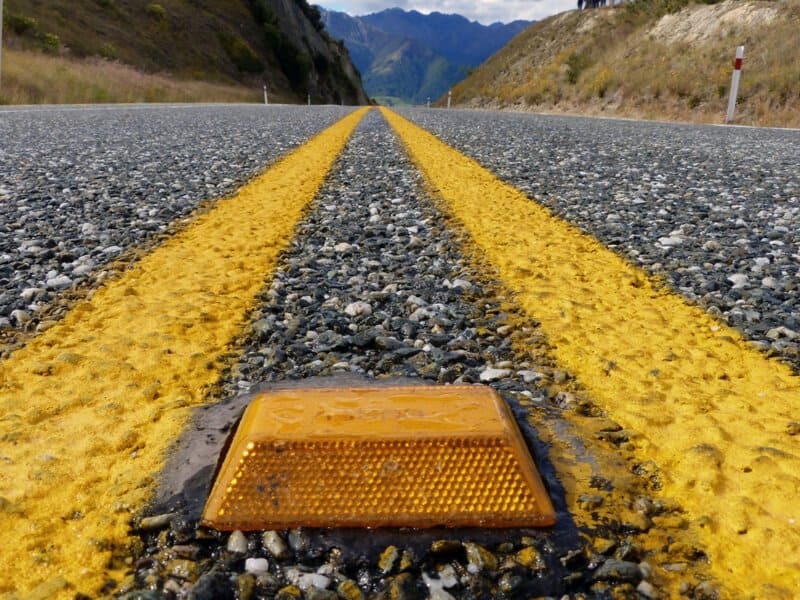 We explain the different types of paints and markers used when highway services are performed. Waterborne paint coupled with glass beads is one of the most common and most economical pavement marking applications available. The glass beads, which are applied immediately after the paint has been sprayed, provide drivers nighttime reflectivity. The paint is usually applied at 10 to 15 mils of wet film thickness. Thermoplastic coupled with glass beads is a far more durable pavement marking application and lasts longer than paint. It's applied at temperatures higher than 400 degrees Fahrenheit and is thicker than paint (normally between 60 and 90 mils). Thermoplastic can be applied onto a pavement surface through either extrusion or spraying. While this option is more expensive than paint, it is a bit cheaper to apply than epoxy. Epoxy couple with glass beads is a far more durable marking material and is designed to be used in Arizona's higher elevation areas (those that are above 4,000 feet) to withstand damage caused by snowplows. This option is a two-part system, with one part of hardener and two parts resin being mixed under high pressure before being sprayed. While epoxy is expensive (the most expensive option available), it is without a doubt the most durable pavement marking options applied by ADA-Striping contractors. It is a low-profile marking and is about 15 to 25 mils thick. Epoxy's durability, and the fact that it is a low-profile application makes it one of the best pavement marking options considering that it handles snow plow damage quite well. ADA-Striping contractors are expected to install the industry's full range of preformed pavement marking tapes. Reflective tape is a sturdy material used in symbols, crosswalks, legends, and in lane line applications that require highly reflective/durable, yet low maintenance materials. Markers are typically applied to roadway surfaces to enhance reflectivity in wet road conditions and at night. This option is applied to the surface of the road using a bituminous adhesive, and may either be recessed in areas snowplows are used or surface mounted. For the recessed option, slots will have to be cut into the road using state-of-the-art truck-mounted grinding/vacuum system. To mark a detour through a work zone or when a roadway's design is changed – for instance when a new lane needs to be added – existing pavement markings will have to be removed. ADA-Striping contractors are well-equipped to handle the removal of striping by either water blasting or grinding the existing striping. Water blasting is typically used in applications when there is a need to protect existing roadways as it doesn't scar the surface that much. ADA-Striping contractors blasters are equipped with a dual-head removal system, which reduces time spent on the road while increasing productivity. The blaster also features a vacuum recovery system. The recovery system main work is to separate the debris removed from the road by the water and prepares the surface for striping shortly after removal. Apart from cutting costs, it also improves the surface by removing film and debris, leaving it ready for re-striping. ADA-Striping contractors are expected to install pavement marking materials below the surface of the road. This is made possible by grinding the roadway's surface to specified depths before the markings are installed in the recessed grooves. We can inlay any pavement markings.